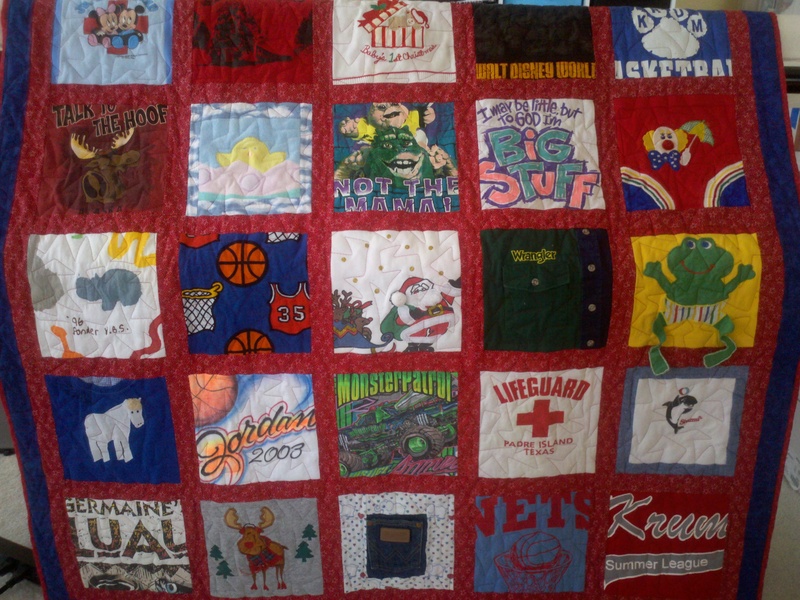 This entry was posted in business, inspiration, quilt making, quilt preparation, quilting and tagged clothing quilts, how to make a t shirt quilt, quilt making, quilt prep, quilt top, quilting, quilting prep, quilts, shirt quilt, t shirt quilt, t shirt quilts, tshirt quilt. Hi – I’m making a tshirt quilt in rag edge style. I’m a first time quilter but long time crafter. I’m happy with the progress, have prepped 50+ shirts. I’m still teetering on whether to use a quilting cotton or flannel for the backing. I’ve heard it done both ways. Any advice? I’m expecting it to be a finished twin size and fear the flannel will be heavy but wonder if the cotton would be too thin. Cool – I’ve seen photos of that and they look neat! Batik will not work, as it won’t fray, but quilting cotton will, so if you prefer, you could use that. Flannel is a bit heavier, homespun is like flannel but not as heavy if you can find that. Homespun will react just like flannel and is fabulous for rag quilts. That is what I would recommend. Hope that helps! Hi I have made some T shirt quilts using knits, but someone has just sent me some clothes that are like sweater knits, have you ever tried this? Hi Lisa, yes, a few times I have come across fabrics that seem impossible. I once used a knit watch cap in a quilt! With materials like this (it was like a knit sweater), it helps to use two layers of stabilizer, if you are using the kind that only stops stretching in one direction. Just use it like normal, and then iron on a second layer turned 90 degrees, which will essentially stop stretch in both directions. They are lightweight enough that it will work and be workable. Sometimes polyester knits can be like this too, but you have to be careful of how hot your iron is, and that can make it difficult to ‘melt’ the stabilizer to it. I have some items from a friend to make some memory quilts for her kids, we were using smaller squares about 6×6 of the shirts so there are enough to go around. Some of the items are light to mid weight sweaters. My quilter isn’t sure if the sweaters can be quilted using the long arm. What are your thoughts? I am really hoping we can quilt them. Thank you! Hi Lynette – I assure you they can be quilted. I have quilted through many a sweater. The thick decals or embroidery patches are what should really be of concern. Those can get caught on the hopping foot or break a needle. Otherwise I assure you it can be (and has been) done! Thank you so much!!! I am thrilled to hear it! 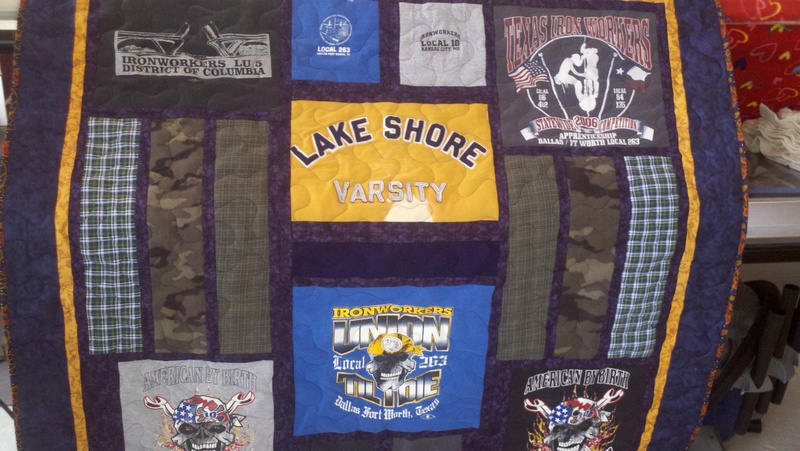 These quilts are so important to me! 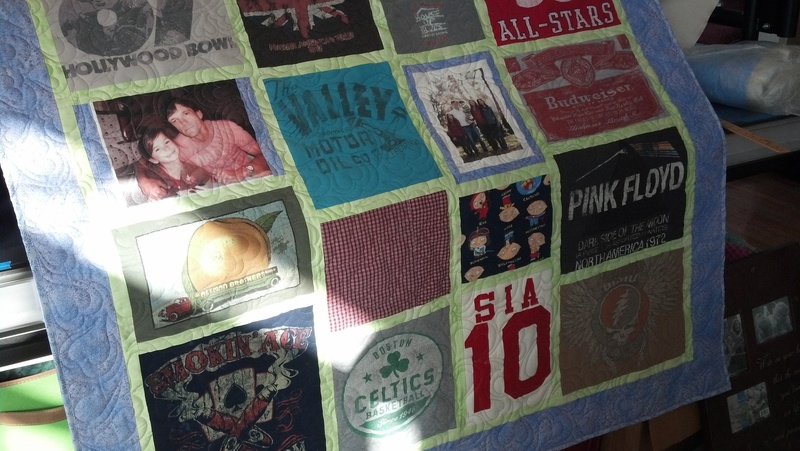 My first time to quilt a t-shirt quilt. What approach do you recommend for t-shirts that have very heavy rubbery heat fused sections? Client put together the quilt beautifully with stabilizer, but did not consider resistance that just forcing the needle through will create. I use a computer driven set-up. Thank you in advance! Hi there! I have those types of shirts often and they can indeed be quilted through, just know that the holes are visible. The ONLY major issue there is IF your thread breaks, you need to be very careful to retrace each hole punch when you restart so you don’t leave a trail of extra holes if that makes sense. I suppose on a computer driven machine that should not be an issue. You could try to go around them (not sure if that is feasible on your machine, probably more difficult than it’s worth) but you can just go through them. From my experience (I have one I did for myself) the holes do not grow when the quilt is washed. Thank you. Made up a test piece using leftover fusible I had on hand . . . used fusible two times in same spot to be sure that coating was thick, then proceeded with stabilizer, backing, etc. Using another machine with feed dogs down and larger needle, did free motion so stitches would be longer (about 9/inch) and slowed down my speed. Have to love Bernina’s stitch regulator. Mounted the real quilt using stitch length and slow speed, size 16 needle, ball point, and absolutely no issues! That’s awesome! I’m so glad to hear it!! Good call on doing the test piece. I have only quilted on my long arm machine so that isn’t as feasible but I’m super glad it worked out for you!! I have two t-shirt quilts pieced and ready for quilting on my longarm. Do you ever use monofilament thread in the top? When there are so many colors in one quilt, what color of thread do you choose? One quilt has lots of black, orange & grey. The backing is a black & white bold print…soccer balls. I really don’t want the thread to stand out. Hi Diane! I understand they often have a wide variety of colors in them. I never use monofilament, as I only seem to have trouble with it. Instead I pick a lighter color thread. I will usually string the quilt up and then choose a few cones of thread and place them over a number of shirts to see which seems to work best. That’s how I choose. Sounds like in this case a light grey will blend in well. Best of luck! Hi there – so sorry to hear this. It happens more often than you think – dogs seem to LOVE eating quilts! It can probably be repaired; I have repaired a few myself. It just takes a bit of work to hand sew a new piece on top, hand sew in some batting to refill the center and then repair the back. If it’s a larger hole, requilting the area repaired would also help mask any work done. How do I patch over 2 tshirt designs? The hole goes straight thru the middle of them. I can send you a pic to your email if you’d like…its hard to describe. Perfect! Thank you!!!! I’ll send it to you tomorrow. Finally just sent the pic to your email. Sorry it took a few days. 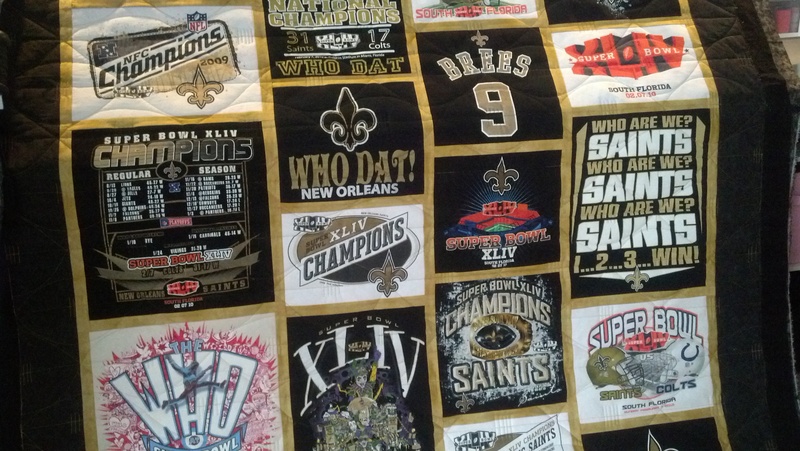 I have a T Shirt quilt totally done; after washing one of my seams have come apart on a shirt and sashing 😦 whats the best way to hand sew it without stretching the jersey? I used interfacing! oh no! well, if the entire thing is constructed and now a seam has come open, your best bet is to try to hand stitch it with a blind stitch, in thread color that matches one or both sides so the thread isn’t too visible. Some fabrics fray differently and that one must have frayed more easily so the one wash was enough for that to unfortunately occur. Sorry to hear!